ERIE, Pa. – Miami couldn’t get a single shot past Providence on Friday. But it took just 29 seconds for Karch Bachman to generate a goal for the RedHawks on Saturday as they beat Mercyhurst, 3-0 in the third-place game of the Ice Breaker Tournament at Erie Insurance Arena. Bachman accelerated through a pair of Lakers defenders, went in alone and buried a forehand shot on the glove side in the opening minute to open the scoring. That was all the offense Miami (3-1) needed, as goalie Ryan Larkin turned 21 shots aside to earn his second shutout in three starts this season, which is already a career high. The junior now has four perfect sheets for his career, with one each his freshman and sophomore years. Ahead by one, Ryan Siroky carried the puck around the back of the Mercyhurst net and stuffed the wraparound into the net to make it 2-0 with 13:51 left in the second period. In the final minute of the middle stanza, Phil Knies stole the puck from a Mercyhurst (0-2-1) skater at center ice, went in alone and slid a backhander through the five hole of goalie Stefano Cantali. Historically, Bachman and Siroky have not been huge goal scorers but both are off to hot starts. Bachman, a junior, netted two goals as a freshman and six last season, but his breakaway tally was his team-leading third marker of 2018-19. Siroky is second on the team behind Bachman with two tallies in four games this campaign after the senior found the net just seven times his first three seasons. 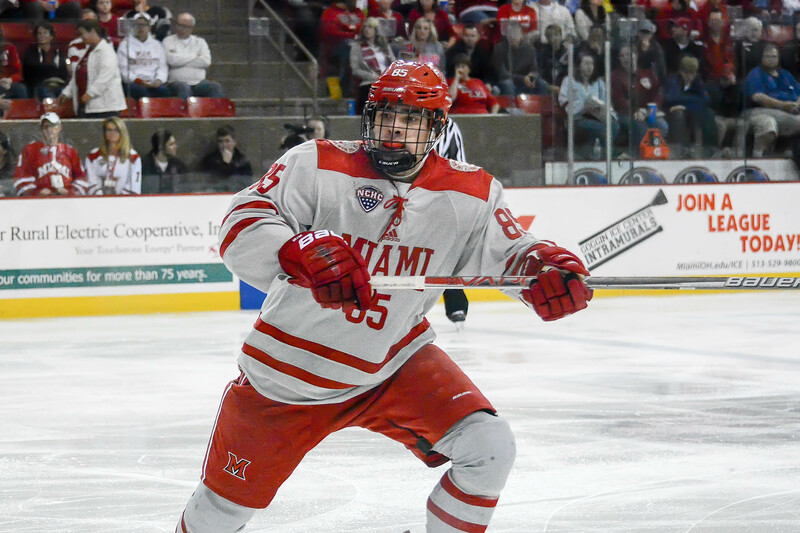 Despite scoring three times, Miami was credited with just one assist, with Christian Mohs notching his first point of the season on Siroky’s goal. Bachman and Knies both scored unassisted. Larkin has made 61 saves on 64 shots (.953), an encouraging sign after last season when his save percentage was just .886. The RedHawks were 0-for-4 on the power play and finished the weekend without a man-advantage goal despite 11 opportunities. After netting a pair of PPGs in its opener, MU has failed to cash on in 14 chances over the last three games. Conversely, Miami’s penalty kill was 6-for-6 and has allowed just one power play goal this season. Bachman took a spearing major in the second period and was ejected. This is the first time the RedHawks have won three of their first four games since 2014-15, and Blasi said he is pleased with the start overall. “You take four-game segments like that, they start to add up,” Blasi said. 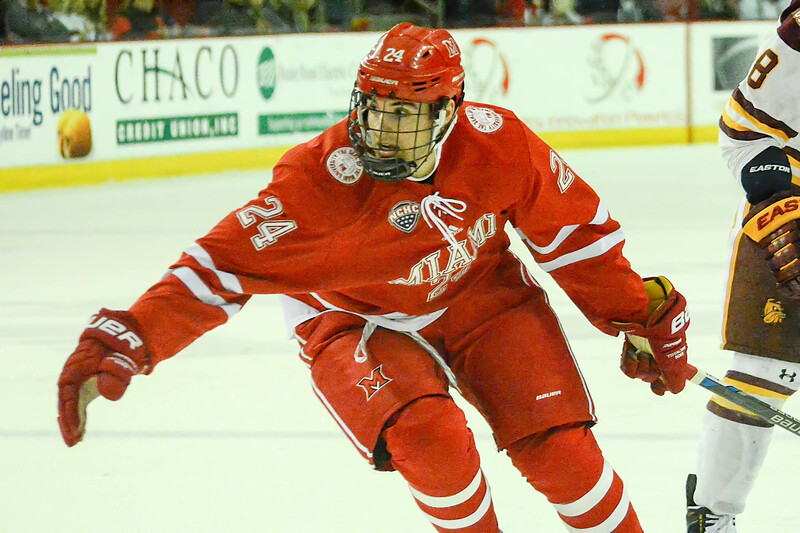 Miami opens a four-game homestand with a two-game series vs. UMass-Lowell next weekend. Colgate comes to Oxford for a pair of contests on Oct. 26-27. First period: 1. Mia., Bachman 3, uag, 0:29. Second period: 2. Mia., Siroky 2 (Mohs), 6:09; 3. Mia., Knies 1, shg, 19:11. Shots on goal: Miami U. 8-18-5 – 31; Mercyhurst 7-6-8 – 21. Power plays: Miami U. 0-for-4; Mercyhurst 0-for-6. 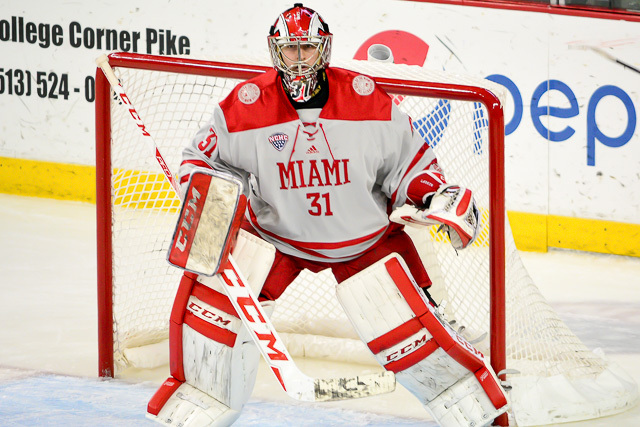 Goalies: Miami U., Larkin (21 of 21 saved); Mercyhurst, Cantali (28 of 31). Referees: Ryan Sweeney, Eugene Binda. Linesmen: Brendan Lewis, Joe Lewis. Time: 2:20. Attendance: 2,387. Posted on October 13, 2018, in 2018-19 and tagged 2018-19 miami redhawks, erie, ice breaker tournament, karch bachman, mercyhurst, phil knies, ryan larkin, Ryan Siroky. Bookmark the permalink. Leave a comment.